Made from natural perfumes, Shield Air Fresheners refresh and deodorise your environment with wonderful bursts of fragrance, leaving a lasting aroma. Hang from desired location or clip onto dashboard. 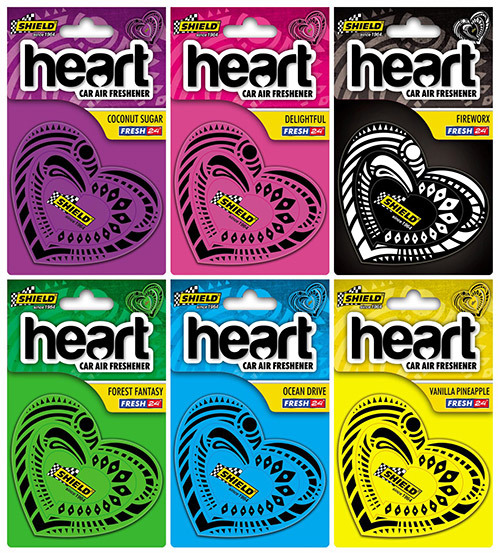 Fresh, trendy and innovative – the new Shield Heart Car Air Freshener is created using the latest in air freshener technology. These creative 3D hearts will keep your car smelling fresh and clean with wonderful bursts of fragrance to make your daily commute a fragrant one.